Photo Studio Management Software | Join CreativeForce.io now! for high volume photo studios. We will send out a monthly update to keep you informed of our progress. A swiss army knife is a great piece of engineering but when it comes to cutting or screw driving – it's not that good. We believe a tool has to be carefully crafted and purposefully built before the user can truly love it. Creative Force offers tools that have been designed and built in collaboration with true photo studio veterans. 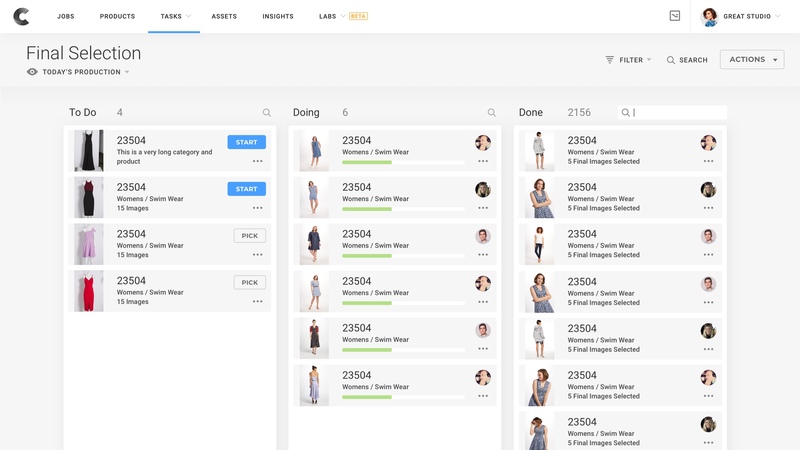 Creative Force gives studio managers and executives real-time knowledge about jobs in progress via its intuitive kanban inspired view. Instantly get updated on specific clients and even inspect the files still hot of the camera. React on exceptions by activating alerts for jobs before they run off course. Get out of the dark! Handling files can be a tough job in a photo studio. Even if you're a super structured type, things don't always go according to plan – and what about the new guys? With Creative Force Capture you visually select the files and connect them with the corresponding data. Files are then transferred to the flow engine where the rest of the process is handled. No more files! We all love data but running with conventional tools like Adobe Bridge and file servers will never allow you to collect real actionable data. Creative Force logs all activities and events occurring in its applications, this enables you to generate reporting for everything from estimates to after calculation. Comment on any job, task, image or outfit and mention teams or individuals for greater collaboration. System generated task lists and scrum methodology will empower your teams to execute according to plan. Integrate any ERP, PIM or DAM System and use your realtime data for renaming, tagging and meta-data. Adaptable to any studio workflow. Large range of specialized views and applications built by studio veterans.